This ‘new and improved’ Orion was unloaded from the Super Guppy and moved to a test stand called the ‘birdcage’ in the high bay inside the Neil Armstrong Operations and Checkout (O&C) Building at KSC where it was showcased to the media including Universe Today. Orion’s arrival at KSC truly signifies a major turning point in achieving NASA’s agency-wide goal of sending humans to the Red Planet in the 2030s to carry out the ‘Journey to Mars’ initiative. “This is an exciting day for NASA with the arrival of Orion,” NASA Orion program manager Scott Wilson told Universe Today. The Orion pressure vessel serves as the structural backbone for the spacecraft. But before it can launch engineers and technicians from NASA and prime contractor Lockheed Martin will spend the next two years meticulously installing all the systems amounting to over 100,000 components and gear required for flight. NASA is planning the first manned flight in about three years later in 2021, depend on the budget allocation. 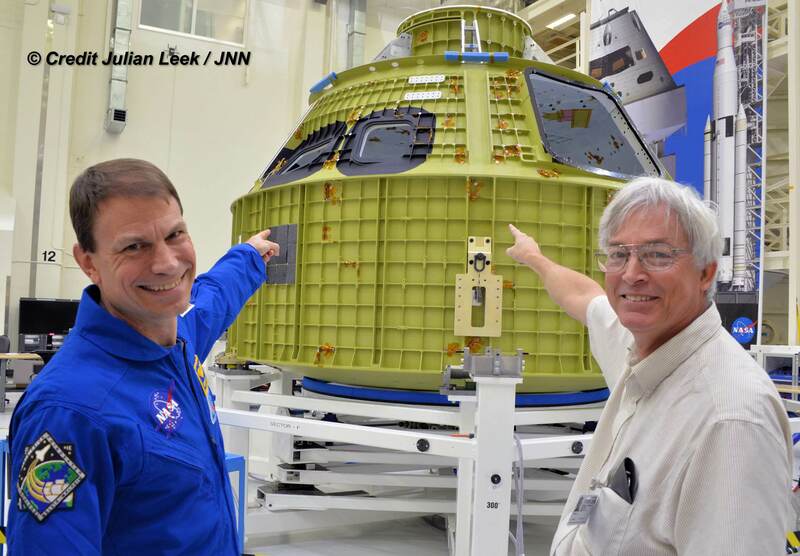 “We are targeting the first crewed flight for around 2021 on Exploration Mission-2 (EM-2),” Mark Geyer,, deputy director of NASA’s Johnson Space Center in Houston, told Universe Today in an interview beside the Orion EM-1 pressure vessel. The olive green colored pressure vessel is the spacecraft’s underlying structure on which all of the spacecraft’s systems and subsystems are built and integrated prior to liftoff for its inaugural flight to the Moon and back. The pressure vessel was manufactured at NASA’s Michoud Assembly Facility in New Orleans, where it was welded into shape by NASA and Lockheed Martin engineers using an advanced friction-stir welding process. The EM-1 pressure vessel weighs about 2700 lbs. It stands 10 feet high and is nearly 5 meters in diameter. 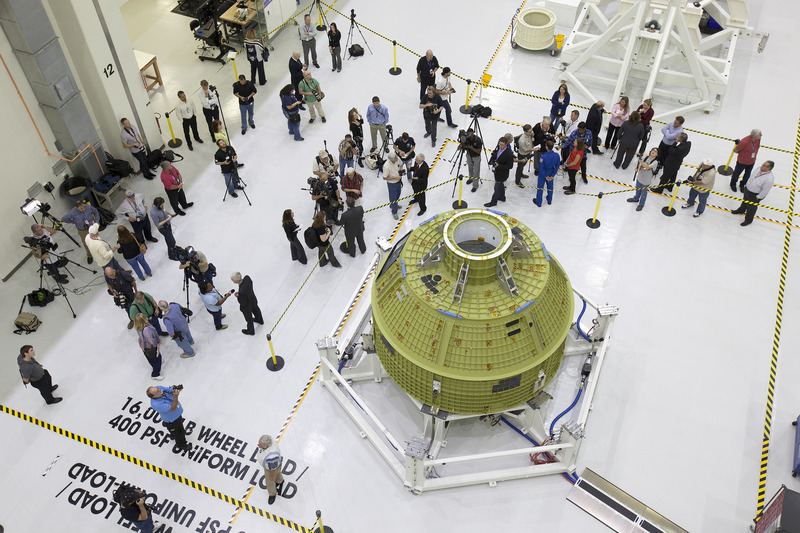 After installing the thermal protection system, the finished Orion flight capsule will be about 11 feet high and 16.5 feet wide. These systems include the heat shield, thermal protection, propulsion, avionics, computers, plumbing, electrical, life support, parachutes and much more. “We plan to power on this Orion one year from now,” Mike Hawes, Lockheed Martin Orion vice president and program manager, told Universe Today in a interview beside the Orion EM-1. Technicians will then continue adding components and test the vehicle along the way. Lockheed is achieving the point of power on in a shorter timeframe compared to the prior Orion EFT-1 spacecraft because of the many lessons learned, Hawes told me. The team “learned how to shed weight, reduce costs and simplify the manufacturing process – all in an effort to improve the production time and cost of future Orions,” said Lockheed officials. The pressure vessel itself is comprised of seven large aluminum pieces that Michoud technicians began welding together in September 2015 using the highly precise state-of-the-art process called friction-stir welding. The last of the seven friction-stir welds to assemble the primary structure for NASA’s EM-1 capsule was finished on Jan. 13. “Some of the weight saving is due to use of a thinner shell and some to the need of fewer welds,” Hawes told me. Among the advances since EFT-1 are that engineers have reduced the number of welds from 33 to 7. This vastly reduced welding requirement saved time, money and weight which can be directly converted into up mass to carry out the exploration mission. 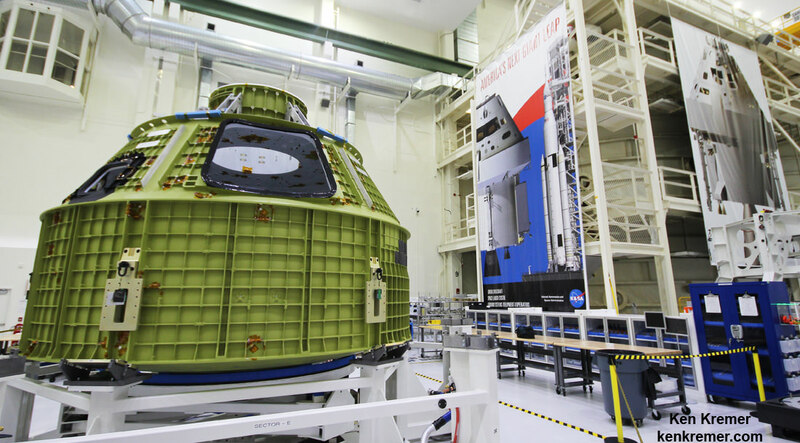 Overall this is the third Orion capsule that NASA has built, following the Ground Test Article (GTA), which did not fly, and the EFT-1 capsule which successfully launched just over one year ago on Dec. 5, 2014. 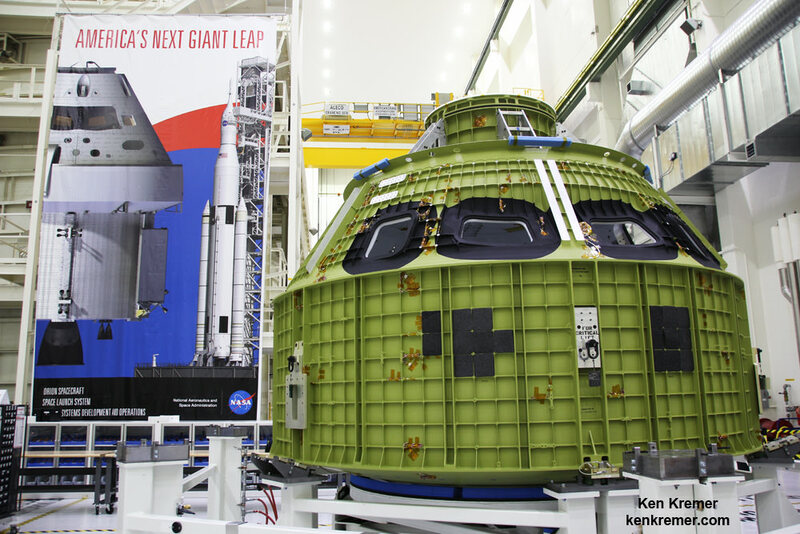 Along with all the vehicle manufacturing at KSC, “the crew module will undergo several tests to ensure the structure is perfectly sound before being integrated with other elements of the spacecraft. First it will undergo proof-pressure testing where the structural welds are stress tested to confirm it can withstand the environments it will experience in space. The team will then use phased array technology to inspect the welds to make sure there are no defects. Additional structural tests will follow including proof-pressure testing of the fluid system welds and subsequent x-ray inspections,” say NASA officials. The 2018 launch of NASA’s Orion on the unpiloted flight dubbed Exploration Mission, or EM-1, counts as the first joint flight of SLS and Orion, and the first flight of a human rated spacecraft to deep space since the Apollo Moon landing era ended more than 4 decades ago. There would have to be a bit more going to Mars than just this capsule and a lander. A lot more space for people and consumables please!